like leads, tin, solder, hot plates, popcorn machines, high speed packing machines, difussion pumps, kettles, large coffee percolators & wash boilers etc. Chrome steel sheath on one side and edges, other flat side is the bare refractory. Coiled electric resistant wire embedded inside. And steel terminal studs with nuts washers. Being sheathed on one side only, It has very little residual heats and stands up to 650° C. Temperatute for its's surface area. If the utensil is having thick buttom. 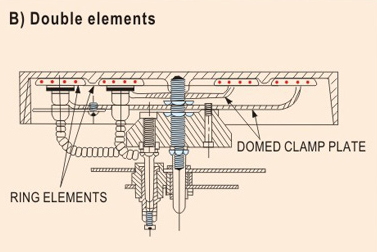 The mounting of the element is very simple. 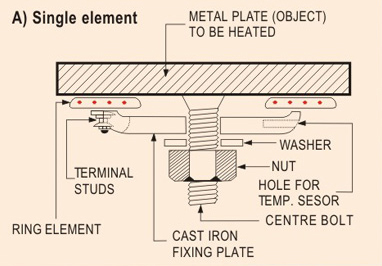 A centre bolt & a concave fixing plate alone being necesasry, as shown. 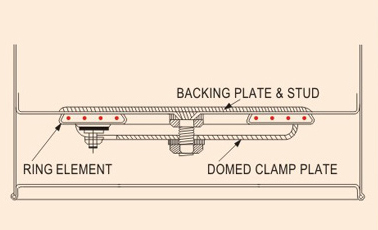 If the utensil button is thin, we suggest to strength it by means of brass / SS backing plates which makes one piece with the fixing bolt mounted as shown. Ring Inside Dia. Ring Outside Dia. 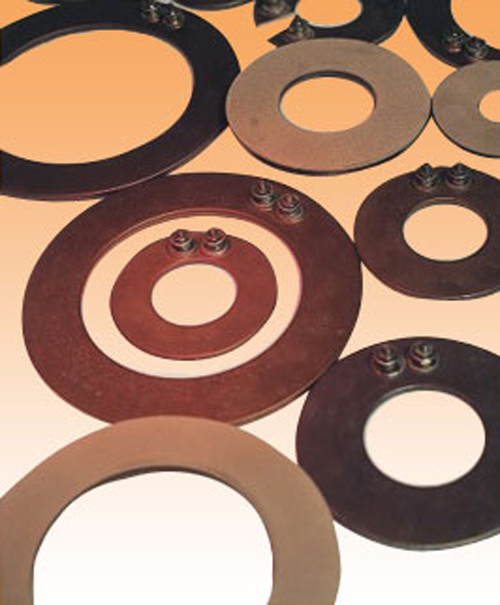 HS - 1 have 4BA thread terminals studs, and all other type are with 2BA threads studs. Heater is not recommended for direct immersion in liquid. Heater wuth different Wattage/Voltage can also be made. Theses Heatercan be used one inside the other in following manners.